The Petro Poroshenko Bloc met behind closed doors. MPs Yehor Firsov and Mykola Tomenko, who left the Petro Poroshenko Bloc (PPB) faction, have been stripped of their seats in parliament. This decision was taken at the PPB congress held behind closed doors, LB.ua has learned from its sources among MPs. The decision was taken by the majority of delegates before the congress was over, the source said. PPB MP Artur Herasymov confirmed the report after the congress. "We had a discussion on the assessment of the PPB-Solidarity MPs' performance in parliament. The congress found it satisfactory overall, however there was a separate discussion on the MPs who tendered their letters to leave the faction. According to Article 81 of the constitution, the congress decided that these MPs should be expelled and give up their parliament seats. I mean Mykola Tomenko and Yehor Firsov," he said. The PPB press service said on Facebook that the decision to strip Tomenko and Firsov of their seats was taken in accordance with Article 81 of the constitution. 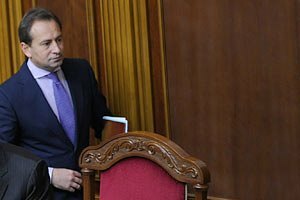 Article 81 of the constitution says that an MP may lose seat if "a Ukrainian MP elected on behalf of a political party (an election bloc of political parties) does not join a faction of this political party (an election bloc of political parties) or if a Ukrainian MP leaves this faction". "If a Ukrainian MP elected on behalf of a political party (an election bloc of political parties) does not join a faction of this political party (an election bloc of political parties) or if a Ukrainian MP leaves this faction, his or her mandate is terminated on the basis of the law on the decision of a senior governing body of a corresponding political party (an election bloc of political parties) as of the day this decision was taken," the constitution reads. There is no such law as mentioned above in Ukraine. Firsov on Facebook called the party's decision a political reprisal. "Everyone understands why the faction decided so. There is no other name to it than political reprisal. People controlling the faction today found me too uncomfortable. I was not shy to raise the issues of [Ihor] Kononenko's corruption, Hranovskyy's schemes of hostile turnover, on overseers, on the corrupt Central Electoral Commission still populated by Yanukovych's people. When I was talking about this at the faction meetings, my colleagues looked at me as if I were an idiot," he said. He added that he was "sad and disappointed" with the faction's decision but did not "clutch at" his parliament seat. Mykola Tomenko left the faction on 23 February in protest against what he described as reformatting of the coalition. Firsov quit on 8 February following Economic Development Aivaras Abromavicius's allegations of influence peddling against senior PPB MP Ihor Kononenko.